Ferris, C. J., Gilmore, K. J., Beirne, S., McCallum, D., Wallace, G. G. & in het Panhuis, M. (2013). Bio-ink for on-demand printing of living cells. Biomaterials Science, 1 (2), 224-230. Drop-on-demand bioprinting allows the controlled placement of living cells, and will benefit research in the fields of tissue engineering, drug screening and toxicology. 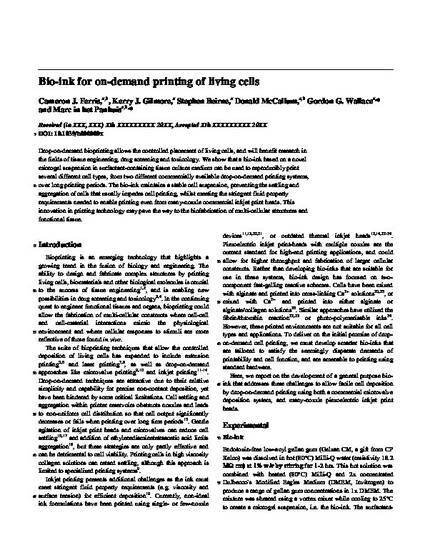 We show that a bio-ink based on a novel microgel suspension in a surfactant-containing tissue culture medium can be used to reproducibly print several different cell types, from two different commercially available drop-on-demand printing systems, over long printing periods. The bio-ink maintains a stable cell suspension, preventing the settling and aggregation of cells that usually impedes cell printing, whilst meeting the stringent fluid property requirements needed to enable printing even from many-nozzle commercial inkjet print heads. This innovation in printing technology may pave the way for the biofabrication of multi-cellular structures and functional tissue.